Since 2004 …one of our specialties has been vehicle biohazard cleanup. As such, we are a trusted partner with many body shops and insurance carriers. As such, we are a trusted partner with many body shops and insurance carriers. Biocontamination can happen in many ways. We find this more commonly occurs as a result of automobile accidents and suicides. Our automobile bio cleaning teams are fully trained to clean all surfaces within your vehicle. With our advanced cleaning techniques, they are able to remediate all aspects of vehicle contamination including cloth seats, leather seats, dashboards, center consoles, contaminated trunks, floorboards, windows, glass, carpets, and headliners. There are no simple shortcuts due to the hot Arizona summers that tend to cause bio odors to set into automobile interiors. Any undiscovered contamination can cause odors to linger. Our trained teams utilize mobile cleaning units to work on-site wherever your vehicle is located. The vehicle bio-cleanup process is most commonly performed at body shops, residences, and tow yards. 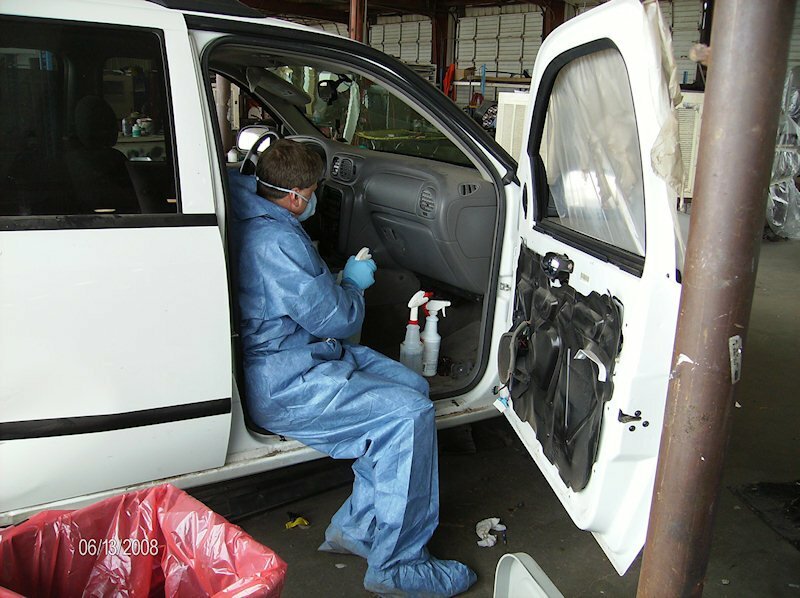 Our technicians are Vehicle Biohazard Cleanup experts and can sanitize a vehicle located almost anywhere. …we know that most families are concerned with the cost. However, in many years of working in this industry, we have found that most insurance companies will cover all or almost all of the remediation expense for the unfortunate event. In most cases, they will cover the complete cost of the cleanup as well as the cost to restore the vehicle back to its original habitable and clean condition. We have worked with the insurance industry for many years and we have a claims specialist on our staff who is familiar with each insurance carrier’s claims procedures and processes. Our company performs the remediation and the sanitizing, however, the replacements of new parts is done by a repair facility like a body shop. Our technicians are not licensed, mechanics. Call to discuss how your vehicle may be cleaned, sanitized and restored, with the costs paid for by your insurance policy. We can answer your questions 24 hours 24 hours a day, all 7 days per week.